-Possibly looking for new theme music. -Heard WTF w/Marc Maron episode with Kumail Nanjiani and how it relates to movie. -Zealotry frightens me more than before. -Am watching Henry Louis Gates series “Faces of America”. -My current views on American History and society in general. -Met up with Keith McNally. -McNally and I got to see Marc Maron do standup before he headed back to CA. Last night I got to meet up with Keith McNally, of XO and I Have A Ham Radio fame and hangout for a bit. We got to reminisce and share our different experiences of living in New York City and compare and contrast them. We also got to see a free comedy show at the Kniting Club in Brooklyn in the neighborhood of Williamsburg. I had heard earlier that day that Marc Maron was going to be doing a guest spot before heading back to CA and thought it would be a great way for Keith to start out his week back in the Big Apple. 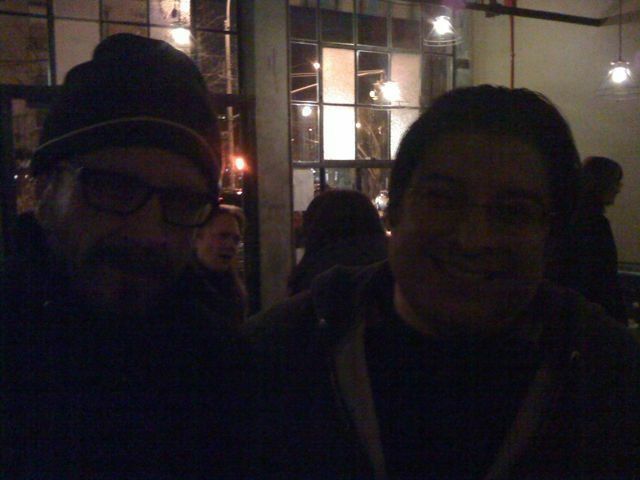 Not only did we get to see him that night but thanks to series of events we actually got to share a booth with Marc Maron and talk to him for a bit before the show began. I took a picture to commemorate the night and I got some stickers from Maron for his podcast, WTF With Marc Maron. It was a great night to say the least. One more note before I go. One of things Keith got to talk to Maron was about his inability to embrace New York City. Marc told him how it isn’t hard once you come up with a system to make the city achieve whatever it is you want to do and how great the city could be once you figure it all out. Then after he finished talking up NYC, in his next breath he talked about how he wasn’t going to be living here anymore and essentially how he couldn’t wait to go back to CA. So far for trying to convince Keith about how great the Big Apple is.